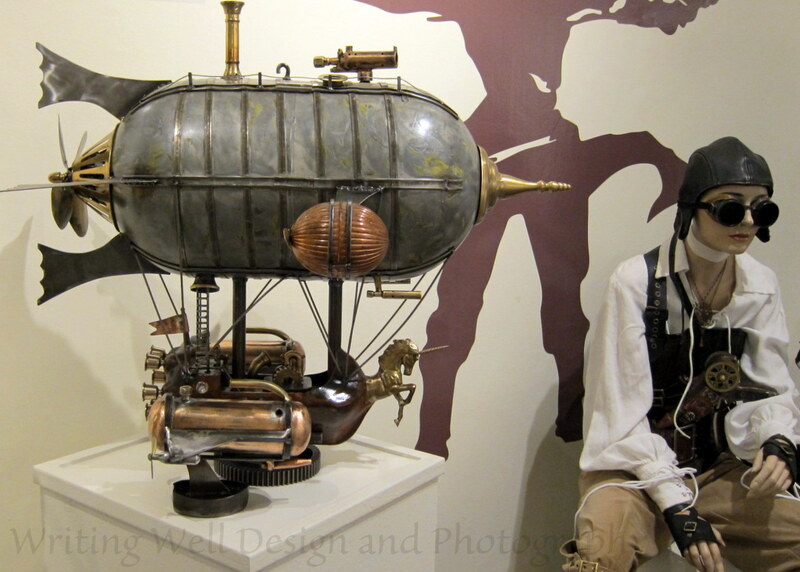 This is a nice example of airship art. I like the unicorn on the prow. The aspect that puzzles me is the brown shape on the wall. What is that supposed to be? It’s just enough of the design to cause my imagination to go wild. You will see the full wall in the subsequent post http://wp.me/p3IavG-tx. At first, I considered photoshopping it out, though generally speaking, only a scant few of my photos have any adjustments aside from cropping. (I feel like its cheating to change them.) Then I considered that this wall graphic makes an interesting background as an unknown. Is it what you expected? What did you think it might be? I figured it was a person, but I could not tell what the extra material was in the photo. It looked a bit like a tree branch to me! Enter your email to follow Writing Well Design and Photography and receive notifications ONLY when there are new posts.